Leading the way in its segment for style, the new generation Hyundai i20 has improved design, ergonomic fluidic sculpture and a range of new colours to choose from. The i20 is available in a 1.2 engine and comes in four different trim levels; classic, deluxe, deluxe plus (with two tone roof option) and deluxe plus automatic. Like all new Hyundai cars, interior space has become a must and not just a luxury. Five adults can sit comfortably within this roomy cabin with carefully chosen interior materials, AUX & USB ports meaning easy connectivity for your smartphone. Stretched headlamps and also LED daytime running lights Hyundai have created a real head-turner with the i20. The New Generation Hyundai i20 does not compromise on safety. It comes with 6 airbags, anti-lock braking system, electronic stability programme and emergency stop signal. For more information on the Hyundai i20, download the new i20 brochure or contact us on 01 8833300. You can also fill out our contact form below to arrange a test drive and one of our staff members will get back to you. Also check out our finance options. 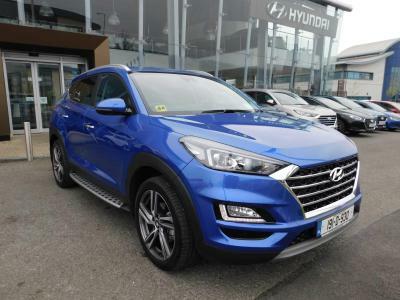 This car is available from €185 per month with PCP at Michael Barrable Motors.